Adam Hopkins is a documenty film maker he has produced films including ‘Wild Things’, ‘Alice and Her Six Dads’, Neighbourhood Watched’ and ‘Trawlermen’ for the BBC, Channel 4 and National Geographic along with alot more. 1. Character and story: you need a great character along with a great story which will be a great narrative, one is not enough with out the other. Even if you have found that character you need to find out what it is that you want to narrate about them, their story. 2. Becoming an expert: The subject is really important you need to understand the subject and what their narrative is, this will make the subject more at ease with you. You need to understand your subject and their story, you dont have to let on that you know so much about it because they want to tell you about it but it is good if you have a good grounding in that subject and story. 3. Get close to your contributors : on an observational programme, Hang out with contributors and building up the trust with them, you have to be honest with them and get them to but in to what the final film is. Explain what your aims are, the more the incline in to the film the more they will become contributors and buy in to the film, then when you need someone for a certain scene they will more than likely help you out. 4. The things you tell your friends: Once you have been on a shoot and you have been away for a few days and you come back and you see friends and family, telling them about things that happen on a shoot, normally you would just tell them a few antidotes, they wouldnt know so much about the story or the subject but telling them a few antidotes, those things you are telling them, you should bare in mind what you are telling them, them things might be things that you want to keep in the film. 5. Narrative in the edit: Adam has learnt this in various experienced offline editours. You might have loads of information and people telling you different things, in your footage you have to work out what information to release at what point in you final film. Holding back information is very powerful, an element of suprise can make a documentry. In the early 1970s, a group of idealistic young adults chose to raise their children collectively. So what happened next? This intriguing documentary goes in search of the grown-up wild kids. I like how in the start if the film there is a mix of music with also the voice of the story and accompanying these storys are photographs that show the family, it just makes you want to look in to this documentry even more. It then shows the house and the voice tells the story of the house that holds the wild children in 1970’s lived in but it is nice that the house today is shown in the video and it goes nicely with this specific story. Then it goes in to an interview of the first woman who called her child wild, this next part now tells you more about it, it is nice that you have the voice of the subject, you get to hear her truthful view on this decission that was made in the 1970’s. I like also how in the documenty it goes in to photographs from the past that showed these people and who he was next going to interview and also the journey along the motorway, it is like you are almost involved in the documentry going to find out more. Watching the video really kept me engaged the whole time, especially when there is the movements of different interviews, each of the subjects had their own voice, you could hear and feel their intentions at the time of the 1970’s when they called their children the wild child, you get to hear their opinion and also from the wild childs, there is a mix of photographs aswell from the time, so you could know exactly what they looked like back then and it brings you today and the reason as to why. This video just keeps you wanting to find out more, it is a fantastic video and it shows the subjects storys so well. David says how in photo journalism and documentry photography that there tends be some very powerful off repeated commonly sited ways of thinking about the relation of the image and the world, an image an politics and what the image can do in terms of compacity for change and this becomes a form of justification a rational for fair amount of photography practise and its worth in questioning that. David says a quote from tod papa george, a photographer that has been working through the 1960’s onwards and has been noticied through out the past few years. Quote: If your pictures aren’t good enough, then you are not reading enough. The question of narrative and context are fundamental in anything, preparing and producing photographic work thats interesting he thinks that work that is most powerful is the work that understands itself and its own context of production and distribution and publication but context in the issues it is trying to portray visually in the images, he thinks that behind the better work. David is saying really about a relationship between the idea of a story, to the idea of an event or an issue and as no automative relationship. Between these things and the story that you produce overtime through images, through associate form of representation and so on. A story will have a connection to an event or an issue or a place or a person but the relationship, the making of a relationship is between an event, issue and something that is specific to time and spaces to this larger story. He also says that narrative is making the whole set of practise of mediations that makes events, issues and other things appear to us as it locates them in storys, it locates them in ways in telling dimension of those things that we can transmit information about those events about those issues to other people and its because of that in any project. Research and reading helps you to show that way you narrate. A narrative is not something that you just pick up and absorb, its your project of showing narrative, this can help by listening to other people that narrate those things. When david says that research and reading is a source of help to show a narrative this refers back to what papa george says that if pictures aren’t good enough, it means your not reading enough and also if your pictures arent good enough then you are not close enough. The research is how much you want to find out and get to know your subject, the closeness tells the narrative more in a project, it becomes more truthfull in a way. David also says even though you want to show every little bit of a story you can’t, you have to include and exclude to create a narrative. I can see what David means, there is a process you have to take when creating a narrative, if the story goes on for to long then it starts to drag and then you can lose your reader/viewer, breaking down the story will make it stand out and this is the process of excluding. You have to be aware of what is being excluded and included throughout creating a narrative. He explains that one of the reasons why narrative is extremely powerful is because it offers a sense of cohearence, if offers a sense of purpose eventhough life itself doesn’t have that. That sense is the subjects the voice, that is what a narrative so powerful, it is not a text, a text you dont get that sense of the subject but in an audio that is added to photographs then it does make them more powerful, giving the subject a voice. The power of narrative it is the dessire, we dessire storys that offer us that look like they can give us a beginning and an end, even if we know that thats so simple, even if we know that it is not exact. It is the dessire we have to events and issues in life that we seek completness. So what David is saying we strive for a story, we view the story and it offers us a sense of that completness of our own lives. For example we see that there has been a flooding, we want to find out more, whether it has effected people, what the causes of the flood was and also what is happening now, looking in to headlining news they catch us, if there is something going on in the world we have the dessire to find out more and to look in to it more as it is of interest of us. So a good start of a narrative is that catching point to wheel the viewer in. David thinks that the most important thing is individuals and the context of the storys and the question that you ask about this is how can individual a person, in body or reveal the large issue that you think is relevent to the story you are doing. So this person may have a story that isquite common in the world and it is the context that you put in to the story that makes this one story stand out to the others. This lecture from David Campbell I have found really interesting and it has helped alot, there are the main points that tell what story you are trying to tell, the most important. I have found in past projects I have always told the story wrong because I look at the story and try and fit everything in. I never consider the main point that would portray this main part of the story perfectly. I have felt that I have photographed the story in the wrong way, the photographs did not link to the story I was trying to tell. The lecture will definetly help with future projects, reading in to the story and finding the parts that are the most important in the story will be what I will look out for and this will create a more powerful narrative. The term massage to marshall is that he is suggesting that the modern audience in media see this massage as something that is soothing, relaxing and enjoyable to the human sensory and how it is making us feel when we see a text or when we read it (how it atracts us). The massage is only a massage if this massage is purely true and so this massage becomes something that we are able to learn from. The medium which is where we get this massage from etc; books, radio and magazines, where it has been heard, but we never really see how the medium is presented to us. All we look in to is the massage from the medium (the source of where the info comes from) it just becomes nothing to us. I have called this video where children wonder, the children wonder around as they explore and learn new facts about nature. I went in to the herbert and took recordings as I walked around, I left the recorder on as I walked around, intruding on a piece of work that the viewers discuss in the gallery, this was what I was hoping to get. I ended up in the nature exhibition which I recorded but at first I thought there was to many sounds and it was so loud because of all the children in there. When I had returned home I listened to all the audio that I had recorded, the sound that standed out the most was the exhibition on nature that was filled with children, the sounds that I got I found were really interesting, the children and how they are amazed by the sounds they are hearing in the exhibition, also that they were creating and the interaction between their close ones, just listening to parts where the children were learning new things are great. After I had selected the audios that I wanted to use and linked them all together I went back to the Herbert, I was hoping for the exhibition to be packed with children and their famillies and friends like it was before and I was going to approach the parents and ask if I could follow their children around the exhibition as they learn new information and explore the exhibition but it was empty. I photographed it empty and after putting these images of the lonely exhibition with the audio it actually looked better as you could get a feel of this atmosphere in this perticular exhibition, the exhibition was now no longer lonely, in a way these audio sounds sounds quite ghostly or like they are from a distance as these people are not shown in the images. The audio is showing you the reactions of what the children and also the adults would have been if they were in the exhibition. I found this lecture really interesting from Mike Lusmore and I found that his lecture will help in my work because I have always had a problem telling a story correctly of a person in photographs, sometime I find that I will be doing something right in capturing the subject and then I just wheel off the tracks but Mikes talk I feel has helped and it also inspired myself to do more audio clips and photographs to tell storys. Mike is photographer, producer he tells photos with storys and media. Starting his work at a national press agency six years ago and then worked himself up to work for the national press itself in London. He created his very first photo film in 2008, and is now working for duckrabbit. They can all be used together to enhance your work, using these new tools and concepts in your work will get them more noticied. Photographs, videos, audio, text, interactive, online games, animation, it can be anyone of these things and more to make one multi media. Photofilms are a piece of photographic work that has an audio or a video combined together, this has given photographers a name in which they can use for this kind of work. You want to produce something that is interesting and something that your audience will want to watch. This is a good example by Mike Lusmore and Rebecca Harley, this is a 3 minute video, it is short but it keeps yourself the viewer engage and you know what is going on. something that tells a story, it can be fact, fiction or truth. The content is mashed to create your story or someones story. He is a photographer that had a story but he could not show the story, to show the story he used other peoples images from mobile phones, he also brought together audio and text and so this becomes a transformative story, using the lots of different media he was able to tell the story. A platform in which we can use our multimedia, to go and create a project. Bottoming out, this is a platform on gambeling addiction, takes an informative look on gambeling addiction in Las Vegas. This video shows tonys own transformative story of his life and the gambeling addiction that he lives. In this re-imagined narrative, Edward Cullen from the Twilight Series meets Buffy the Vampire Slayer. It’s an example of transformative storytelling serving as a pro-feminist visual critique of Edward’s character and generally creepy behavior. Seen through Buffy’s eyes, some of the more sexist gender roles and patriarchal Hollywood themes embedded in the Twilight saga are exposed – in hilarious ways. Ultimately this remix is about more than a decisive showdown between the slayer and the sparkly vampire. It also doubles as a metaphor for the ongoing battle between two opposing visions of gender roles in the 21ist century. Jonathon McIntosh takes clips from two different series of two completly different programme and film but they both have a similarity as they are both about vampires. It is amazing how Jonathon has put these clips together so well and he has created his own tranformative story from using these resourses. The way in which he has put the sounds and the clips go so well together. Garner a portfolio of 8-10 images from different photographers whose work inspires you. Choose carefully, as though your edit was going to appear as a spread in a printed magazine, you may choose to lay them out as such if you wish, with attention to scale, pace and flow etc. The portfolio must directly address a theme of your choosing – it could be a personal theme or a topical one, the choice is yours. The layout of my images are all not perfectly lined and are not all the same size. There are a mix of sizes with in the images and the placements are different to each other, this is the way that I would like to see my favourite images from the photographers. I have used a text that looks like it is from a type writer, I like the way that I have set the text out, using the full name but both of the names are not in line with each other and the surname follows on towards the end of the page on the line below. I was thinking of using text of how the images make me feel around images but I think I will have a practise doing this from the edits of the magazine spread I have done already from what I have shown below. 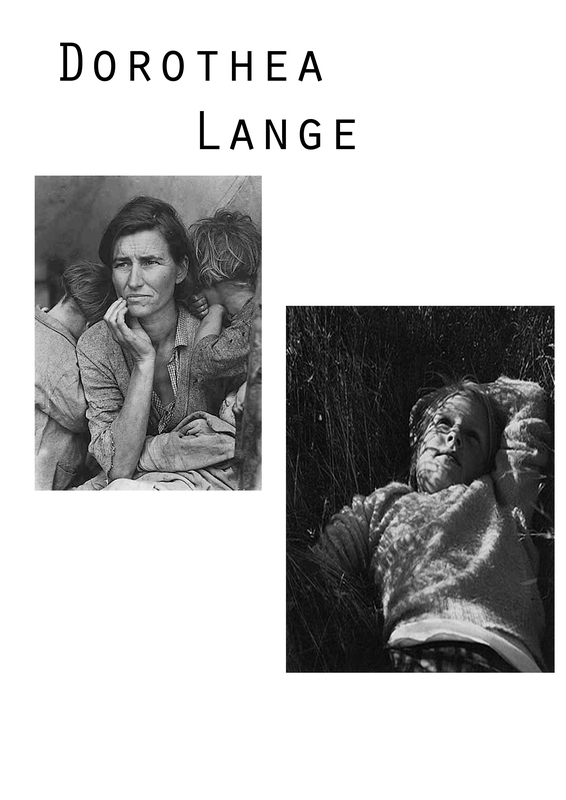 The chosen images have come from the two photographers Dorothea Lange and Nan Goldin. Nan Goldin she is one of the most photographers that connects with my work, she captures this initmacy of people that only she can explain, she gets to know how they are feeling, the closeness that she has with her subjects, each one of her images show this truth of the person and who they really are and because there is such a strong connection her images really stand out. Dorothea Lange I find her images are interesting, she would have a connection with her subjects, documenting the effects that the great depression was doing to peoples live, she captured a part of history, she shows you what you remember today. I feel that both of these photographers have a same similarity, they both have a stong connection when photographing their subjects and they document a persons life so well, they portray a story so well in photographs, of which is strong. You are currently browsing the archives for the 351MC Photography and Narrative (#Phonar) category.